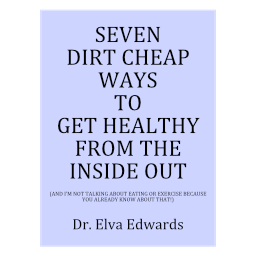 December 2017 – Dr. Elva Edwards, D.C.
Isn’t it nice to get a new start? We think of the new year as bringing us new opportunity to “do it differently.” And, of course, that brings in all of the “over the top” New Year resolutions. Although the New Year feels like a major “do over,” you can have a do over at any time. Really, you can. Each month is an opportunity to do it differently than the previous month. Of course, you can micro down and say each week is different. What about each day is different? You can continue down to each moment can be different. The operative words are “can be” because the moments change, but do you? Do you want to change? Are you willing to change what you are doing? Sometimes yes and sometimes no. You are the deciding factor. You can change if you want to. You can stay the same if you had rather. Either way life goes on and our attitude makes the difference. See you in 2018. Let’s remind each other to keep a positive attitude and be willing to change if it is in your best interest! Here we come, 2018!! You know how some days you just feel good. You might describe it as, “I’m on the top of my game.” Then other days, you just aren’t feeling your best. Remember that all kinds of bugs like bacteria, virus, parasites and fungus are opportunistic organisms. That means, they will take advantage of you any time they can. That virus might be a dormant in your body, but you party like there’s no tomorrow, you stay up late at night, you drink too much of everything, you go on a sugar binge and then you wake up one day wondering why you feel so bad. Those bugs used their opportunity to get you while you are down. And down you feel. When you are sick, you don’t have to eat, but you must drink. You need to rest. You need to be in bed before 10 pm every night. No sugar, no dairy, and no flour. Rest your body. Add lemon to your drinking water. Take my detox bath. Stay worm. When you start feeling better, do not go 100 miles per hour. Easy does it. Let your body take its time because when you have a relapse, it is always worse than the first time. Enjoy the holidays and don’t become a bug’s big opportunity! !